Kim Jong-un's speech over the weekend to members of his politburo saw his sister being promoted, but he also talked about his priorities for the future. What were they? I know what you're thinking. It must be nuclear, right? A few caveats here - it's difficult to find a comprehensive transcript in English of his remarks anywhere so what we do have is excerpts gleaned from the North Korean news service, KCNA. But the speech is revealing in what it tells you about the "supreme leader's" priorities at the moment. Just take a look at the number of times the economy pops up in his speech. Twice as often in comparison to how much he mentions nuclear weapons. And can his focus on the economy shed some light on what he's thinking? In his speech, Kim Jong-un also said that North Korea's economy is doing well, despite the sanctions put in place by the West. That may be wishful thinking, given the fact that the sanctions are being enforced relatively stringently. And that's affecting the economy. Although it's hard to get reliable figures on North Korea's economy, some data has shown that gasoline prices have been volatile, and the cost of basic goods have reportedly been rising. That will hurt North Korean households. "North Korean households are richer than they were before," Byung-Yeon Kim, author of the book Unveiling the North Korean Economy tells me from Seoul. "Their consumption level has increased since the 1990s. A reduction in consumption levels for both the elites and the households will make them unhappy - and that will create a divide between Kim Jong-un and his people. That's dangerous for his political security." So when sanctions target foreign trade it does start to bite. And that goes goes back to the central question of Kim Jong-un's political survival. The fact that Kim Jong-un mentions the economy so often is "quite rational", says Mr Kim. It is part of his strategy of "Byungjin", the dual development of the economy and the nuclear weapons programme. Byungjin is also about Kim Jong-un's survival. 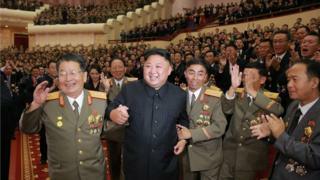 The nuclear deterrent is his way of securing his position with the international community, adds Mr Kim. The strategy is to develop nuclear weapons and stay safe - and not end up the way that the Gaddafi or Saddam Hussein regimes did. But the economic development of North Korea is also Kim Jong-un's way of ensuring that the domestic population stays indebted to him, and that he maintains power amongst the elites. For all his of talk of "Juche", or the guiding principle of self reliance, the makeup of North Korea's economy has changed dramatically over the past decade or so, says Michael Madden of North Korea Leadership Watch. Almost half of it comes from foreign trade and the economy has been "growing modestly" over the last few years. The idea that North Korea is a closed "autarky" - able to survive without international trade - is no longer valid. It's more of a hybrid model. It's biggest trading partner has been China - but now with Beijing enforcing the sanctions more than it has in the past, North Korea has had to look elsewhere to keep growth going. Enter Russia, says Ankit Panda of The Diplomat. "I don't want to suggest they [Russia] are substituting China - the figures don't add up," he tells me. "But there are examples of closer co-operation. A couple of weeks ago a Russia telecoms company extended an internet line to North Korea, for instance." All of this seems to point to the central argument that the economy is key to Kim Jong-un's survival. The international community focuses far too much on Kim Jong-un's preoccupation with nuclear missiles, points out John Delury of Yonsei University. We should concentrate far more on what he says about the economy. "When you talk about economic development, Kim Jong-un suddenly becomes not so crazy, and becomes familiar to East Asia, where you have had developmental dictators, who have turned their economies around - but were also brutal." A controversial view - but one that bears considering. Some analysts argue that if Kim Jong-un could be persuaded that putting the economy ahead of nuclear development is in his self-interest and could help him with his political survival - it may help to de-escalate tensions on the Korean peninsula.